Located 40 minutes from Patong Beach, Bang Tao Beach is a crescent shaped bay eight kilometers long, fringed by rows of Casuarina trees. This pure white sand beach has its main entrance two kilometers north of Surin Village, marked with large signs from the sprawling Laguna Phuket complex, which occupies most of the middle of the bay. The Laguna Phuket Complex is a community of five luxury resort hotels, designed in similar, cottage - style architecture. It is situated around a beautiful lagoon. Blooming flowers are everywhere with tastefully designed rock gardens and waterfalls to give the guests a serene and happy environment for a carefree, all-inclusive holiday. A worldwide famous event is the annual Thai Airways Phuket Laguna Triathlon, that was held for the seventh time on December 2nd, 2000. The constant but gentle breeze makes Bang Tao Beach very popular with wind surfers and it plays host to several international competitions each year. Located in front of the Dusit Laguna Hotel is the Phuket Laguna Riding Club that offers horseback riding along the beach. Kalim Beach is actually a continuation of Patong Beach on the northern curve of the coastline. It is located just north of the artistic rocky outcroppings which separate it from Patong beach. It is a small, charming beach with rocky points and coral reefs. Kalim is a quiet alternative to bustling Patong Beach, yet just in convenient walking distance to the tourist services and night life of Patong. At low tide, the coral reefs at the northern end of Kalim Beach are close enough to the shore to be explored on foot. They contain an amazing variety of living creatures. Seashells, crustaceans, tiny fishes, starfish and sea cucumbers are found in the coral pools. Caution: It is not wise to walk barefoot because some of the rocks are razor sharp. Wear a strong pair of sandals or track shoes. The northern half of the beach is exposed to the monsoon winds, and on occasion from June to September the waves become big enough for surfing here. Just fifteen minutes by tuk tuk north of Patong Beach lies Kamala Beach. Along the way, from the Khao Phanthurat viewpoint, you can see the whole bay with its magnificent 2.5 kilometers crescent shaped beach. 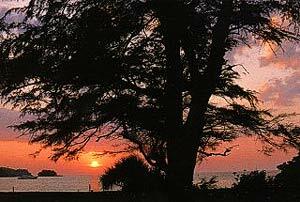 The northern end of the unspoiled and scenic bay features a sandy beach, shaded by Casuarina trees. The atmosphere is very relaxed and it is a very pleasant location for those who are looking for a quiet place for sunning or taking a long quiet stroll along an almost deserted beach. 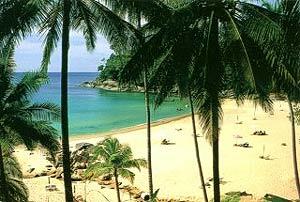 Kamala Bay provides besides its family attractions good swimming in crystal clear water on its northern end. To explore the coral reefs just a few meters offshore, all you need are fins and a snorkel to enjoy the underwater beauty. Even more magnificent scenery awaits you if you are a scuba diver. 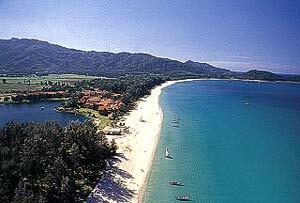 The middle part of Kamala Bay is dominated by a village with small resorts dotted along the beach. It is a popular community for longer-term visitors to the island. The fishing village atmosphere remains with fishermen casting their nets and the occasional water buffalo roaming the beach unattended. Some small bars and seafood restaurants line the beach here, giving the opportunity for refreshment. Only 20 minutes north of Patong, Laem Sing Beach is located on a steep mountain range, hidden from the road and relatively undiscovered by tourism. There is a small parking area and only a few handmade signs, making it a place easily missed by the masses. After a short walk down a narrow footpath, you arrive at the little bay, winged by round-shaped granite boulders. There are some two hundred meters of flashing white sand and picturesque rock formations in the ocean, which offer some of the best snorkeling opportunities on the island. There are no streets, buildings or cars, allowing for a feeling of serenity and peace rarely found on other Phuket beaches. For refreshment however, snacks, drinks and perhaps beach chairs are available from the few walking vendors. Located in the Nai Yang National Park, Mai Khao Beach at the northern end of Phuket Island has a total length of nine kilometers and is the longest beach on Phuket. It is a place full of peace and serenity to the visitor. Mai Khao is one of the few beaches in Thailand, where still sea turtles land to lay their eggs. They can be occasionally sighted by divers in the area. To prevent the numbers of sea turtles from dwindling further, there are annual efforts to protect the beach in the nesting season between November and February. On Songkran, the nationwide Thai water festival on April 13, baby turtles are released into the sea at various locations. Because of its remote location, there is almost no development, so if you are in search of a remote and isolated beach for yourself, this is it. Camping is allowed at various locations on the beach within the campgrounds. This beach can be highly recommended for just relaxing, walking on the sand or combing the beach for shells. Caution is advised for swimming however, since the beach has steep shelving sands at the waterline. Visitors to this beach can find a special kind of shellfish here, named Sea Cicadas (Chakkachan thale), which are found in mass under the sand and only in this locality. The body of this crustacean is oval with short legs, reminiscent of a crab. In many restaurants in Phuket, these Sea Cicadas are among the secret delicacies that the visitor should not miss, since they prove to be a tasty meal when fried in butter or as the ingredient of a spicy salad. 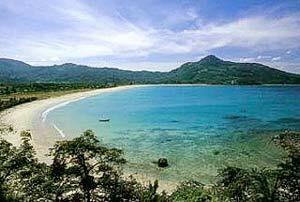 Nai Yang Beach is a quiet and serene strip of sand in a national park, backed by a lovely, tree-shaded hinterland. Nai Yang Beach has a very different feeling from the beaches to the south. The locals use it as a picnic spot, especially on the weekends. During low tide swimming can be good and a large coral reef a short distance offshore is home to a wide variety of sea life. Seashells wash ashore frequently here, making the area especially good for shell collectors. Surin Beach is a quiet and very relaxing beach, a rather undeveloped bay lined by a row of high Casuarina trees which give shade to those who are tired of Phuket's tropical sun and provide a pleasant change from the common palm trees found everywhere else. It is the favorite beach for the locals, who flock here on weekends and holidays to enjoy seafood and other freshly prepared meals in one of the beach restaurants. 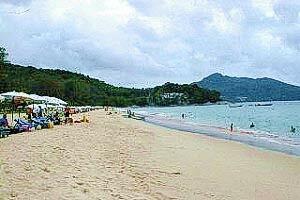 Unlike most Phuket beaches, Surin Beach has a steep sand shelf, making it not so suitable for swimming. Big waves are common on Surin beach during the monsoon season and can create dangerous undertow conditions. Surin Beach offers some good snorkeling opportunities at both ends of the beach but during the rainy season the water visibility is not very good, due to high turbulence. Surfing is becoming increasingly popular here because there are often good waves during monsoon season.